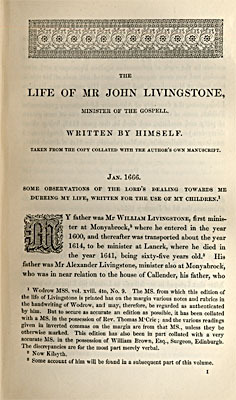 A Brief Historical Relation of the life of Mr John Livingstone, minister of the gospel, containing several observations of the divine goodness manifested to him, in the several occurrences thereof. during his banishment in Holland, for the cause of Christ. A new edition, with appendix. My father was Mr. William Livingstone, first minister at Monybroch (The same as Kilayth), where he entered in the year 1600, and thereafter was transported, about the year 1615, to be minister at Lanark, where he died in the year 1641, being sixty-five years old. His father was Mr Alexander Livingstone, also at Monybroch, who was a near relation to the house of Calender. His father was killed at Pinkiefield, anno 1547, being a son of the Lord Livingstone, which house thereafter was dignified to be Earl of Linlithgow. My father was all his days straight and zealous in the work of reformation against Episcopacy and ceremonies, and was once deposed; and wanted not seals of his ministry, both at Monybroch and also at Lanark. My mother was Agnes Livingstone, daughter of Alexander Livingstone, portioner of Falkirk, come of the house of Dunipace. She was a rare pattern of godliness and virtue. She died in the year 1617, being about thirty-two years of age. She left three sons and four daughters. I was born in Monybroch, in Stirlingshire, the 21st of June 1603. 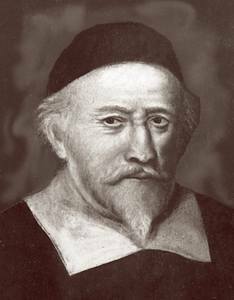 The first period of my life, I reckon from my birth to the first day I preached in public, which was at Lanark, on a Sabbath afternoon, the 2d of January 1625. Having at home learned to read and write, I was sent, in the year 1613, to Stirling, to a Latin school, where Mr William Wallace, a good man, and a learned humanist, was schoolmaster; where I stayed till summer 1617; at which time I was sent for, to be present with my mother dying. About October 1617, I was sent to the College of Glasgow, where I stayed four years. I passed master of arts July 1621. After that I stayed in my father's, in Lanark, till I began to preach. During this time, I observed the Lord's great goodness, that I was born of such parents, who taught me somewhat of God so soon as I was capable to understand anything, and had great care of my education. I had great fears about my salvation when I was but very young. I saw somewhat of the example and carriage of sundry gracious Christians, who used to resort to my father's house, especially at communion occasions: such as Mr Robert Bruce, and several other godly ministers, the rare Countess of Wigtown, Lady Lillias Graham, who also at my baptism desired my name, because her father, her husband, and eldest son, were all of that name; the Lady Culross, the Lady Bantoon, and sundry others. It is remarkable, that Mr William Wallace came but a short while to Stirling before I was sent thither to school, and the year after I left the school he also left that charge. Likewise worthy Mr Robert Boyd of Trochrigg, was but lately come from Suamur in France, to be Principal of the College of Glasgow when I went thither,a dn went from the college the year after I left it. The while I was in Stirling, Mr Patrick Simpson was minister there -- a man learneed, godly, and very faithful in the cause of God; and in Glasgow, I heard Mr John Bell - a grave, serious man; and Mr Robert Scot, who also was once deposed for opposing the corruptions of the time. The first year after I went to Stirling school, I profited not much, and was often beaten by the schoolmaster; and one day he had beaten me on the cheek with a stick, so that it swelled. That same day, my father came occasionally to town, and seeing my face swollen, did chide with the master, that he having a chief hand to bring me to that place,he should use me so. The master promised to forbear beating of me, and I profited a great deal more in my learning after that. And when, in September 1616, I with the rest of my equals, had gone through all the Latin and Greek that was taught in the school, and so were ready to go to the college, and my father was come to bring me home for that end, the schoolmaster prevailed with my father (I being so young, and the master having hopes of my proficiency) that I should stay one other year; and thus another boy and I stayed another year. We for the most part read by ourselves in a little chamber above the school, the mster furnishing us books, where we went through the most part of the choice Latin writers, both poets and others; and that year was to me the largemost profitable year I had at the schools. Of what passed when Mr John Livingstone appeared before the council in the lower council-house at Edinburgh, December 11, 1662, at which time they banished him. Lord Chancellor. -- You are called here before his Majesty's secret council for turbulency and sedition. You have been in all the rebellions and disobedience to authority that have been these many years; and although his Majesty and Parliament have given an act of indemnity for what is past, yet you continue in the same courses. Mr Livingston. -- My Lords, if I shall not be so ready in my answers, as were requisite, or if anything, through inadvertency, shall offend, I crave to be excused in regard of my unacquaintedness with such ways, as being now towards sixty years, and was never before called in such sort before such a judicatory. I am a poor servant of Jesus Christ, and have been labouring to serve him and his people in the ministry of his word, and it is a grief to me to be so charged by your Lordship; for I am not conscious to myself of any turbulency or sedition. There are some things anent the officers and government of the Church wherein I confes my judgement and principles differ from what is presently maintained; but I have laboured to carry myself with all moderation and peaceableness with due respect to authority, and have lived so obscurely, that I wonder how I am taken notice of. L. Ch. -- You have transgressed two acts of Parliament -- one appointing the 29th day of May a day of commemoration of his Majesty's happy restoring, and another appointing the snynods to be keeped. Did you preach on the 29th day of May? Mr. Liv. -- There are witnesses in town who testify that I preached the last 29th day of May. L. Ch. -- [But] did you keep the day as is appointed in obedience to the act of Parliament? Mr. Liv. -- I dare not say that I did so: it was my ordinary lecture-day; yet the place of Scripture that was my ordinary gave occasion to speak somewhat of the benefit of magistracy. L. Ch. -- But will [not] you publicly, as others do, acknowledge the Lord's mercy in restoring the king? Mr. Liv. -- I have (My Lord) done so, both at the first, and sometime since. L. Ch. -- But what is the reason that you do not keep the day appointed by the Parliament? Mr. Liv. -- My Lord I have not that promptness of judgment or expression that were requisite for surprising questions, and would beg, if your Lordship please, that I may be forborne. L. Ch. -- Can you not give a reason why you keep it not? Mr. Liv. -- My Lord, there may be some expression that may furnish a scruple to a man who conceives that God only can appoint a holy-day. L. Ch. -- But you kept days of your own. You kept a day of thanksgiving for the battle of Langmarston Moor, and several days of fasting in the time of the engagement. Did you not keep the day for Langmarsten Moor? Mr. Liv. -- So far as I know, I did; but these days were not, or were not called, holy-days, but only appointed on several occasions; and besides, one may scruple if any have power to appoint anniversary holy-days. L. Ch. -- But will you keep that day hereafter? Rev. John Livingston, D.D., was minister of Killinchie in Ireland, & in 1648 was settled as minister of Stranwawere (sic) in Scotland. In 1694)8 he removed to Ancram in Teviotdale; and, after the restoration of Charles II, declining to take the oath of allegiance, he was banished and became the minister of the Scotts Chapel at Rotterdam in Holland, where he died. Reverend John Livingston, minister of Ancrum, who was born at Monyabroch, June 21, 1603, and at the age of ten years was sent to a Latin school, where we are told "Mr. William Wallace, an good man and a learned humanist was school-master." He subsequently spent four years at the University of Glasgow, and was graduated as a master of arts. Licensed in January, 1625, he commenced to preach at his father's and neighboring churches, but his aversion to Episcopal ceremoies prevented him for several years from being ordained minister and obtaining the presentation to a living in Scotland. In 1630 he accepted the invitation of Viscount Clandeboye to take charge of the parish of Killinchy in Ireland. He was there a year when the Bishop suspended him for non-conformity, but through the invervention of Archbishop Usher [James usher (1581-1656) Archbishop of Armagh, Primate of Ireland], the suspension was raised after a short time. The Scottish bishops, however, brought pressure to bear on the Irish government, and on May 4, 1632, he was again deposed for non-conformity. This suspension lasted two years. Later he made several futil attempts to emigrate to America. He was in Scotland in 1637, taking a prominent part in the movement of the solemn league and covenant, venturing to London in 1638 "with several copies of the covenant and letters to friends at Court." In November, 1638, he was a member of the General Assembly, which met at Glasgow, and with the exception of that, which convened at Aberdeen in 1640, served in each General Assembly until 1650. He acted as chaplain of the regiment of the Earl of Cassillis, when England was invaded by the Covenanters. In 1641 he was in attendance on the Scot's army in Ireland under Sir George Monro. Between 1642 and 1648 he was employed on a series of missions to Ireland. In the latter year he was transferred by the General Assembly to Ancrum in Roxburghshire. In 1650 he was nominated by the Church of Scotland as one of the three delegates on the commission sent by the Committee of Estates to treat with Charles II, then at Breda, as to the conditions upon which he would be permitted to land in Scotland. Cromwell had his name inserted as one of the ministers in the ordinance of August 8, 1654, for settling the affairs of the Church of Scotland and "for certifying such as were proper to be admitted to a benefice." For refusing to honor the anniversary of the restoration of King Charles II as a "holiday of the Lord" he was ordered to appear before the Privy Council on December 9, 1662, but being forewarned, left Ancrum before the messenger arrived with the summons and went to Edinburgh, where he remained "close for some days" while his friends were ascertaining what the government proposed to do. He appeared before the Council and was ultimately sentenced to banishment within two months and ordered to leave Edinbursh within forty-eight hours for the north side of Tay and there to remain "till he depart forth out of the country." He remained at Leith until April 9th, when he boarded "old John Allan's ship" for Rotterdam. Here he spent the last few years of his life. Much of his time was occupied in compiling a polyglot Bible and preparing a new Latin translation of the Old Testament. His wife and two of his children joined him the following December; the other five then living remained in Scotland. he died in Rotterdam between August 14, and 21, 1672, in the seventieth year of his age. He married, June 23, 1635, Janet Fleming, eldest daughter of Bartholomew Fleming, of that well-known Scottish family, the head of which was the Earl of Wigton, who with his son Lord Fleming was present at the wedding of his kinsman's daughter Janet. She was born November 16, 1613, and was buried in Rotterdam February 13, 1693-94. John Livingston was born in the manse of Kilsyth in 1603. He was one of those happy souls who can never date their second birth. Claimed for God in his infancy by the mighty faith of his parents, reared in a home that shone with the beauty of holiness, he could never remember a time when he did not love God, and yearn to please Him. In his schooldays he was a member of the Church at Stirling, and never did a communicant approach the table in a more fitting frame. A holy awe came upon him that made his very body tremble, but soon sweet comfort and assurance came to this lamb of the Good Shepherd. He ardently desired to serve Christ, and at first he thought he could best do so as a physician. But one day, as he meditated in a cave by the Mouse Water, God spoke and called the lad. He left the cave with the conviction that one path alone lay open to him. He must serve in the ministry of the Gospel. He prepared himself at Glasgow College, and in 1625, when the holy fire fell at Stewarton, he began to preach Christ. The True Church was quick to perceive the grace of God in him, and in many places his pastoral services were eagerly sought. But everywhere the Bishop forbade his settlement. His warm evangelism was highly oftensive to the "moderate" palate, and so young Livingston entered the furnace. For five long years he remained there. It was a heavy trial. With a heart hungering to preach Christ, with fields of service invitingly opened before him, he was held back by the grim hand of the royal episcopate. But, though he knew it not, God' s hand was quietly overruling the enemy' s purpose, and refining him for a glorious task. And now we have to note, as so often before in the story of Revival, how God made use of a seemingly fortuitous circumstance to further His great purpose of grace. It happened that some ladies of high rank, who mourned in secret the decline of the Reformed Faith, were travelling in the neighbourhood of Shotts when their carriage broke, down. The accident took place beside the manse. The minister, Mr. Hance, hastened out and invited them to shelter under his roof until repairs were completed. They gladly did so, and finding the minister' s house was sadly dilapidated, and indeed in a still more parlous state than their carriage, they returned his kindness soon afterward by building a new manse in a better situation. Kindness begets kindness. When Mr. Hance waited upon the ladies to thank them, he asked if there was anything he could do to express his gratitude. Then they ventured to make a bold request, a request that was the real outcome of their secret prayers. Would he open his church at the coming sacrament to some of the persecuted ministers, whom they named? Mr. Hance at once consented, and amongst those named was the young man, John Livingston. The communion was fixed for June 20th, 1630. Great interest was aroused, and from all parts a vast assembly was gathered together. Rich blessing followed the Word at the Sabbath services, so rich indeed that it was felt they could not part without an added day of thanksgiving. And it was on this added day that God outpoured the superabundant blessing. After much persuasion Livingston consented to preach on the morrow. Finding their hearts too full of joy for sleep, many formed themselves into little companies, and spent the whole night in fervent devotion, in praise and supplication. The young preacher was one of these praying bands, and when the morning came a sore trial beset him. As he thought of the great, expectant multitude, he was overwhelmed by a sense of utter unworthiness, incompetence, and insufficiency. All strength seemed to leave him, and he was brought down to the dust of death. So real and painful was the abasement that he gave up all thought of preaching, and was preparing to steal away through the fields when his friends gathered about him, and constrained him to remain. 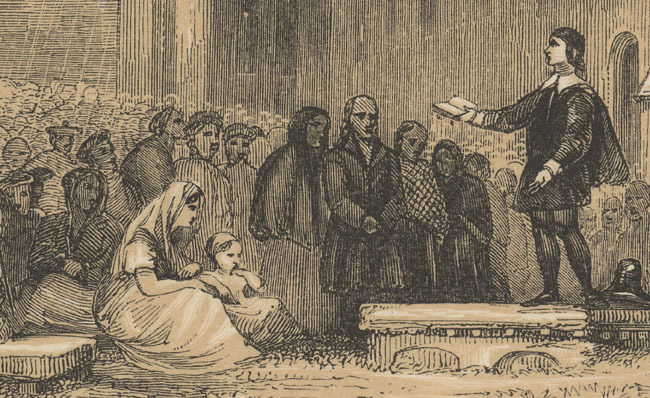 And so, on June 21st, in the Churchyard of Shotts, John Livingston stood up amongst the people, feeling himself the weakest and least of God' s creatures. Then was fulfilled the saying of the prophet Hosea, "When Ephraim spake trembling, he exalted himself in Israel." God uplifted him and perfected His strength in the young man's weakness. His text was Ezekiel 36. 25, 26: "Then will I sprinkle clean water upon you and ye shall be clean. A new heart also will I give you, and a new spirit will I put within you." As he expounded it, burning thoughts and burning words filled his heart and lips. For an hour and a hal.f he preached to a people Who seemed rooted to the ground in a great stillness, Then when he thought he must close, again the Spirit filled him with a fulness that must be outpoured, and for another hour he continued with a melting of heart and liberty of utterance he never experienced before and never after. Five hundred men and women, some from the high ranks of society, some poor wastrels and beggars, were converted where they stood, and lived from that day as those who had indeed received a new heart and a new spirit. The memory of that day has never died, and the very telling of its story, as at Kilsyth, has proved a fount of revival. "Worthy famous Mr John Livingston," as he was fondly termed by his contemporaries, received the rudiments of learning at home, and at the age of ten was sent to study the classics under Mr Wallace, a respectable teacher at Stirling. During the first year he made little progress, and was rather harshly treated by the schoolmaster; this was corrected by a remonstrance from his father, after which he profited very rapidly by his studies. When he had completed his third year at Stirling, it was proposed that he should go to the Glasgow university; but his father eventually determined that he should remain another year at school, and this, he informs us, [In his life, written by himself, Glasgow, 1754.] was the most profitable year he had at school, being chiefly devoted to a course of classical reading. During the time of his residence in Stirling, Mr Patrick Simpson, a clergyman of much note, officiated in the parish church; and Mr Livingston relates, that, on receiving the communion from his hands, he experienced a physical agitation of an uncommon character, which he believed to have been occasioned "by the Lord for the first time working upon his heart." At his father�s house in Lanark, to which he returned in 1617, in order to attend the death-bed of his mother, he had further opportunities of profiting religiously; for it was the occasional resort of some of the most distinguished clergymen and "professors" of that age. The celebrated Mr Robert Bruce was among the number of the former; and of the latter were the countess of Wigton (whom Livingston himself calls the "rare"), lady Lillias Graham, already mentioned, lady Culross, still more famous than any of the rest, and lady Barnton. It seems to have then been a common practice for such persons as were conspicuous for religious earnestness, of whatever rank, to resort much to each other�s houses, and to take every opportunity, when on a journey, to spend a night in a kindred domestic circle, where they might, in addition to common hospitalities, enjoy the fellowship of a common faith. To a large mingling in society of this kind, we are no doubt to attribute much of the sanctity for which Mr Livingston was remarkable through life. The subject of our memoir received his academical education at the university of St Andrews, where Mr Robert Boyd was then principal, and Mr Robert Blair, another eminent divine, the professor of theology. Being tempted at this time by some proposals for a secular profession, he adopted the expedient of retiring to a cave on the banks of Mouse-water (perhaps the same which sheltered Wallace), where he spent a whole day in spiritual meditation, and ultimately resolved to become a preacher of the gospel, as the only means of securing his own eternal interests. During the progress of his subsequent studies in divinity, he gave token of that firm adherence to presbyterian rules which characterized him in his maturer years. He was sitting with some of the people and a few of his fellow students in a church in Glasgow, when the archbishop (Law) came to celebrate the communion for the first time after the episcopal fashion established by the Perth articles. Seeing the people all sitting as usual, Law desired them to kneel, which some did, but among the recusants were Livingston and the little party of students. The archbishop commanded them either to kneel or depart: to this Livingston boldly replied, that "there was no warrant for kneeling, and, for want of it, no one ought to be excommunicated." Law only caused those near them to move, in order that they might remove. Mr Livingston became a preacher in 1625, and for a considerable time preached for his father at Lanark, in the neighbouring parish churches. He had several calls to vacant churches, especially to Anwoth in Galloway, which was afterwards filled by the celebrated Rutherford. The increasing rigour of the episcopal regulations appears to have prevented him from obtaining a settlement, He was at length, in 1627, taken into the house of the earl of Wigton at Cumbernauld, as chaplain, with permission to preach in the hall to such strangers as chose to accompany the family in their devotions, and also to minister occasionally in the neighbouring pulpits. He was living in this manner when he produced the celebrated revival of religion at the kirk of Shotts. This, it seems, was a place where he always found himself in the enjoyment of an unusual degree of "liberty" in preaching, On Sunday, June 20, 1630, the communion was celebrated at Shotts to a large assemblage of people, among whom were all the more eminently pious women of rank in that part of the country. The impression produced by the solemnities of the day was so very great, that many did not depart, but spent the whole night in prayer and conference. [The bed-room of lady Culross was filled with people, to whom she prayed "three large hours� time," � "having great motion upon her." �Livingston�s Life, MS. Ad. Lib.] Among these was Mr Livingston, who being requested to give a sermon next morning to the still lingering multitude, walked forth very early into the fields. Here, he says, "there came such a misgiving of spirit upon me, considering my unworthiness and weakness, and the multitude and expectation of the people, that I was consulting with myself to have stolen away somewhere." He had actually gone to some distance, and was losing sight of the kirk of Shotts, when the words, "Was I ever a barren wilderness or a land of darkness," were brought into his heart with such an overcoming power, as constrained him to return. In the ensuing service he "got good assistance about an hour and a half" upon the text, Ezek. xxxvi. 25, 26. "Then will I sprinkle clean water upon you," &c. "In the end," says Mr Livingston, "offering to close with some words of exhortation, I was led on about an hour�s time, in a strain of exhortation and warning, with such liberty and melting of heart, as I never had the like in public all my lifetime." The effect of the address is spoken of by Fleming, in his "Fulfilling of the Scriptures," as "an extraordinary appearance of God, and down-pouring of the Spirit, with a strange unusual motion on the hearers," insomuch that five hundred, it was calculated, had at that time, "a discernible change wrought upon them, of whom most proved lively christians afterwards. It was the sowing of a seed through Clydesdale, so as many of the most eminent christians in that country could date either their conversion, or some remarkable confirmation of their case, from that day." The importance of such a sermon, in propagating religion in a country where it was as yet but imperfectly introduced, has given this event a prominent place�not perhaps in the history of the church of Scotland, but certainly in the history of the gospel. It caused Monday sermons after the celebration of the communion to become general, and appears to have been the origin of that now habitual practice. Livingston gives some curious particulars in reference to this signally successful preaching. He officiated on the ensuing Thursday at Kilmarnock, and there he was favoured with some remains, as it were, of the afflatus which had inspired him on the former day. Next Monday, however, preaching in Irvine, "I was so deserted," says he, "that the points I had meditated and written, and had fully in my memory, I was not, for my heart, able to get them pronounced. So it pleased the Lord to counterbalance his dealings, and hide pride from man. This so discouraged me, that I was upon resolution for some time not to preach--at least, not in Irvine; but Mr David Dickson could not suffer me to go from thence till I preached the next Sabbath, to get, as he expressed it, amends of the Devil. And I stayed, and preached with some tolerable freedom." Finding all prospect of a parochial settlement in his native country precluded by the bishops, Mr Livingston was induced, in August, 1630, to accept the charge of the parish of Killinchie, in the north of Ireland, where a considerable portion of the population consisted of Scots. Here he ministered with great success, insomuch that, by one sermon preached in the neighbouring parish of Holywood, he was calculated to have converted a thousand persons in as effectual a manner as he had done the five hundred at Shotts. Such extensive utility is, perhaps, only to be expected in a country such as Scotland and Ireland then were, and as America has more recently been; but yet, as similar acts are recorded of no contemporary clergyman whose name is familiar to us, we must necessarily conclude, that there was something in the oratorical talents and spiritual gifts of Mr Livingston, which marked him out as a most extraordinary man. His success, as a minister, is less agreeably proved in another way�by the persecution, namely, of the bishop in whose diocese he officiated. After being once suspended and replaced, he was, in May, 1632, deposed, along with Messrs Blair, Welsh, and Dunbar; after which, he could only hold private meetings with his flock. He and several of his people were now become so desperate, as to the enjoyment of religion, in their own way, under British institutions, that they formed a resolution to emigrate to America. He accordingly set sail from Weymouth; but being driven back by a contrary wind, some circumstances induced him to change his mind. Almost immediately after his return, he and his deposed brethren were reinstated by a letter of the lord deputy Strafford; and, for a year and a half, he continued to preach at Killinchie. Mr Livingston�s salary, in this charge, was only four pound a-year; yet he takes pains to assure us, that notwithstanding all his travels from place to place, and also occasional visits to Scotland, he never wanted money. He lets slip, afterwards, however, that he received sums occasionally from the countesses of Eglintoune and Wigton, and other devout ladies. His mode of life was so fully justified by the circumstances of the times, which rendered it by no means singular, that Mr Livingston was not deterred from forming a matrimonial connexion. He had formed an attachment to the eldest daughter of Bartholomew Fleming, merchant in Edinburgh, "of most worthy memory." The young lady was also recommended to him by the favourable speeches of many of his friends. Yet�and the fact is a curious trait of the age and of the man�he spent nine months "in seeking directions from God," before he could make up his mind to pay his addresses. "It is like," he says, "I might have been longer in that darkness, except the Lord had presented me an occasion of our conferring together; for, in November 1634, when I was going to the Friday meeting at Antrim, (the lady was then residing on a visit to Ireland,) I forgathered with her and some others, going thither, and propounded to them, by the way, to confer upon a text, whereon I was to preach the day after at Antrim; wherein I found her conference so just and spiritual, that I took that for some answer to my prayer to have my mind cleared, and blamed myself that I had not before taken occasion to confer with her. Four or five days after, I proposed the matter, and desired her to think upon it; and, after a week or two, I went to her mother�s house, and, being alone with her, desiring her answer, I went to prayer, and desired her to pray, which at last she did: and in that time I got abundant clearness that it was the Lord�s mind that I should marry her, and then propounded the matter more fully to her mother; and, albeit, I was then fully cleared, I may truly say it was about a month after, before I got marriage affection to her, although she was, for personal endowments, beyond many of her equals, and I got it not till I obtained it by prayer; but, thereafter, I had greater difficulty to moderate it." The parties, having proceeded to Edinburgh, were married in the West Church there, June 23, 1635, under circumstances of proper solemnity, notwithstanding that archbishop Spottiswood, chancellor of Scotland, was understood to have issued orders for the apprehension of Mr Livingston some days before. The wedding was attended by the earl of Wigton and his son lord Fleming, and a number of other pious friends. Having returned to Ireland, he was, in the ensuing November, once more deposed, and even, it appears, excommunicated. He continued, nevertheless, to hold forth at private meetings in his own house, where Blair, also again deposed, took up his abode. At length, in renewed despair, he once more embarked, along with his wife, for the American colonies; but, strange to say, after having sailed to a point nearer to the banks of Newfoundland than to any part of Europe, he was again driven back; after which, conceiving it "to be the Lord�s will that he should not go to New England," he made no further attempt. For about two years, Mr Livingston preached occasionally, but always in a somewhat furtive manner, both in Ireland and Scotland. He was in the latter country in 1637, when at length the bishops brought matters to such a crisis, as terminated their supremacy in Scotland, and enabled such divines as Mr Livingston to open their mouths without fear. Mr Livingston was present at Lanark when the covenant was received by the congregation of that place; and he says, that, excepting at the Kirk of Shotts, he never saw such motions from the Spirit of God; "a thousand persons, all at once, lifting up their hands, and the tears falling down from their eyes." Being commissioned to proceed to London, to confer with the friends of the cause, in reference to this grand national movement, he disguised himself in a grey coat and a grey montero cap, for the purpose of avoiding the notice of the English authorities. An accident which befell him on the way, confined him, after his arrival in the metropolis, to his chamber; but he was there visited by many friends of liberty in church and state, including several of the English nobility. He had not been long in London, when the marquis of Hamilton informed him, through a mutual friend, that the king was aware of his coming, and threatened "to put a pair of fetters about his feet." He was, therefore, obliged to retire precipitately to his own country. In July 1638, Mr Livingston was enabled, under the new system of things, to enter upon the ministry of the parish of Stranraer, in Wigtonshire; a place with which he had long been familiar, in consequence of his frequently passing that way to and from Ireland. Here his zeal and eloquence appear to have been deeply appreciated, insomuch that the people flocked even to hear his private family devotions, filling his house to such a degree, that he had at length to perform these exercises in the church. It is a still more striking proof of his gifts, that multitudes of his Irish friends used to come over twice a-year to be present at his ministrations of the communion. On one occasion, he had no fewer than five hundred of these far-travelled strangers; on another, he had twenty-eight of their children to baptize! Such was then the keen appreciation of "free preaching," and the difficulty of obtaining it under the restrictions of the episcopal system, that some of these people were induced to remove to Stranraer, simply that they might be of the congregation of Mr Livingston. It is confessed, indeed, by the subject of our memoir, that the obstructions which the Irish presbyterians encountered at that time, in hearing the gospel preached after their own way, tended materially to excite and keep alive religious impressions in their hearts. "The perpetual fear," he says, "that the bishops would put away their ministers, made them, with great hunger, wait on the ordinances." The narrow views of that age prevented the king or his ecclesiastical friends from seeing the tendency of their measures; but the result was exactly accordant to the more extended philosophy of our own times. We have now less persecution, and, naturally, a great deal more indifference. It is a fact of too great importance to be overlooked, that Mr Livingston was a member of the general assembly, which met at Glasgow in November 1638, and decreed, so far as an unconstituted association of the clergy could do so, the abolition of episcopacy in Scotland. He accompanied the army in the campaign of 1640, as chaplain to the regiment of the earl of Cassillis, and was present at the battle of Newburn, of which he composed a narrative. In November, he returned to Stranraer, where, in one Sunday, notwithstanding the smallness and poverty of the town, he raised a contribution of no less than forty-five pounds sterling, for the use of the army. A large portion of this, it must be remarked, was given by one poor woman under very peculiar circumstances. She had laid aside, as a portion to her daughter, seven twenty-two shilling pieces and an eleven-pound piece: the Lord, she said, had lately taken her daughter, and, having resolved to give him her portion also, she now brought forward her little hoard, in aid of that cause which she seriously believed to be his. In these traits of humble and devoted piety, there is something truly affecting; and even those who are themselves least disposed to such a train of mind, must feel that they are so. Mr Livingston appears to have always retained a warm feeling towards the presbyterians of the north of Ireland. At the breaking out of the rebellion in 1641, when these poor people fled in a body from the fury of the catholics, multitudes came into Scotland, by the way of Stranraer. Of the money raised in Scotland to relieve the refugees, �1000 Scots was sent to Mr Livingston, who distributed it in small sums, rarely exceeding half-a-crown, to the most necessitous. He complains, in his memoirs, that out of all the afflicted multitudes who came in his way, he hardly observed one person "sufficiently sensible of the Lord�s hand" in their late calamity, or of their own deserving of it, "so far had the stroke seized their spirits as well as bodies." This is a remark highly characteristic of the age. One more valuable occurs afterwards. Being sent over to Ireland with the Scottish army, "he found," he says, "a great alteration in the country; many of those who had been civil before, were become many ways exceeding loose; yea, sundry who, as could be conceived, had true grace, were declined much in tenderness; so, as it would seem, the sword opens a gap, and makes every body worse than before, an inward plague coming with the outward; yet some few were in a very lively condition." If Mr Livingston had not been accustomed to regard everything in a spiritual light, he would have argued upon both matters with a view simply to physical causes. He would have traced the savage conduct of the catholic Irish to the united operation of a false religion, and the inhumane dominancy of a race of conquerors; and the declining piety of the Presbyterians, to that mental stupor which an unwonted accumulation of privations, oppressions, and dangers, can hardly fail to produce. It is strange to a modern mind, to see men, in the first place, violating the most familiar and necessary laws respecting their duty to their neighbours, (as the English may be said to have done in reference to the native Irish,) and then to hear the natural consequences of such proceedings, described as a manifestation of divine wrath towards a class of people who were totally unconnected with the cause. Mr Livingston was minister of Stranraer for ten years, during which time he had not only brought his own flock into a state of high religious culture, but done much, latterly, to restore the former state of feeling in the north of Ireland. In the summer of 1648, he was translated, by the general assembly, to Ancrum, in Roxburghshire, where he found a people much more in need of his services than at Stranraer. In 1650, he was one of three clergymen deputed, by the church, to accompany an embassage which was sent to treat with Charles II., at the Hague, for his restoration to a limited authority in Scotland. In his memoirs, Mr Livingston gives a minute account of the negotiations with the young king, which throws considerable light on that transaction, but cannot here be entered upon. He seems to be convinced, however, of the insincerity of the king, though his facility of disposition rendered him an unfit person to oppose the conclusion of the treaty. Being of opinion that the lay ambassadors were taking the curse of Scotland with them, he refused to embark, and was, at last, brought off by stratagem. In the ensuing transactions, as may be conceived, he took the side of the protestors; but, upon the whole, he mingled less in public business than many divines of inferior note in spiritual gifts. During the protectorate, he lived very quietly in the exercise of his parochial duties; and, on one occasion, though inclined to go once wore to Ireland, refused a charge which was offered to him at Dublin, with a salary of �200 a-year. After the restoration, he very soon fell under the displeasure of the government, and, in April, 1663, was banished from his native country, which he never more saw. He took up his residence at Rotterdam, where there was already a little society of clergymen in his own circumstances. In narrating the events of this part of his life, Mr Livingston mentions some curious traits of his own character and circumstances. "My inclination and disposition," he says, "was generally soft, amorous, averse from debates, rather given to laziness than rashness, and easy to be wrought upon. I cannot say what Luther affirmed of himself concerning covetousness; but, I may say, I have been less troubled with covetousness and cares than many other evils. I rather inclined to solitariness than company. I was much troubled with wandering of mind and idle thoughts. For outward things, I never was rich, and I never was in want, and I do not remember that I ever borrowed money, but once in Ireland, five or six pounds, and got it shortly paid. I choosed rather to want sundry things than to be in debt. I never put any thing to the fore of any maintenance I had; yea, if it had not been for what I got with my wife, and by the death of her brother, and some others of her friends, I could hardly have maintained my family, by any stipend I had in all the three places I was in." The remainder of his life was spent in a manner more agreeable, perhaps, to his natural disposition, than any preceding part. He had all along had a desire to obtain leisure for study, but was so closely pressed, by his ordinary duties, that he could not obtain it. He now devoted himself entirely to his favourite pursuit of biblical literature, and had prepared a polyglot bible, which obtained the unqualified approbation of the most learned men in Scotland, when he was cut off, on the 9th of August, 1672, in the 70th year of his age. Just before he expired, his wife, foreseeing the approach of dissolution, desired him to take leave of his friends. "I dare not," said he, with an affectionate tenderness; "but it is likely our parting will be but for a short time." Mr Livingston, besides his Bible, (as yet unpublished,) left notes descriptive of all the principal clergymen of his own time, which, with his memoirs, were printed in 1754. Some of his children emigrated from Scotland to the state of New York, where their descendants have, in the course of time, become people of the first distinction and weight in society. The late Dr John H. Livingston, minister of the Reformed Dutch church in New York, professor of Divinity to that body, and president of Queen�s college, New Jersey�one of the first men of his age and country, and to whose memoirs, by Mr Alexander Gunn, we have been indebted for some of the preceding facts--was the great-great grandson of the subject of this memoir. Robert Livingston (1663-1725) was the son of Robert "the Manor Lord" Livingston's older brother James, a merchant in Edinburgh, Scotland. Robert the Nephew emigrated to America when he joined his uncle, the Lord of the Manor of Livingston, on his way back from London in 1696, where he had pleaded for the payment of funds due to him by the colonial government. 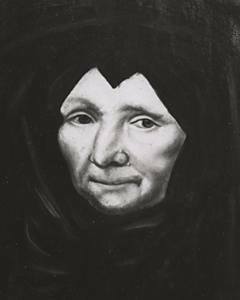 In 1697, Robert the Nephew married Margarita Schuyler, a daughter of Mayor Peter Schuyler and Engaltie Van Schaick. Known in New York history as "the Nephew," Robert Livingston was born in Scotland in 1663. He was the son of James Livingston - who was the uncle of Albany's Robert Livingston. Coming to America in 1687, he would learn the ins and outs of opportunity from his uncle - one of the most successful newcomers of the latter part of the seventeenth century. Over the next two decades, he assumed many of Robert Livingston's Albany-based activities during his uncle's frequent absences and after the senior Livingston relocated south to his mid-Hudson manor. In 1697, thirty-four-year-old Robert Jr. married fifteen-year-old Margarita Schuyler - eldest daughter of Albany's first mayor, thus sealing a family alliance that began with the marriage of Robert Livingston to Margarita's aunt Alida Schuyler two decades earlier. The marriage produced six children who were baptized in the Albany Dutch church where the Scottish-born nephew had made a lifelong connection. A frequent baptism sponsor, he served as church warden and was involved in its financial operations. After living in the home of Robert Livingston, by the mid-1700s the new couple had established their own first ward household. Robert Jr's. first jobs involved assisting his uncle as city and county clerk. Within a few years, he held the titles of deputy secretary and deputy clerk. In 1708 he was elected alderman for the first ward. In 1709, he was appointed recorder (or deputy mayor) of the city. At the same time, he was able to prosper in business using family connections and experience to supply both settler and military customers. By 1710, Robert Livingston had become one of the most visible of the Albany merchants. In that year, he was appointed mayor of Albany and served until 1719. His mayoralty came at the beginning of three decades of peace and oversaw the transition of his adopted community from trading post to supply and services center and the settlement of the city's lands at Schaghticoke. Following his tenure as mayor, Livingston continued to serve the Commissioners of Indian Affairs, manage his personal business, and tend to the placement of his family. He made his will on April 4, 1725 - leaving the entire estate to Margarita as long as she remained a widow. 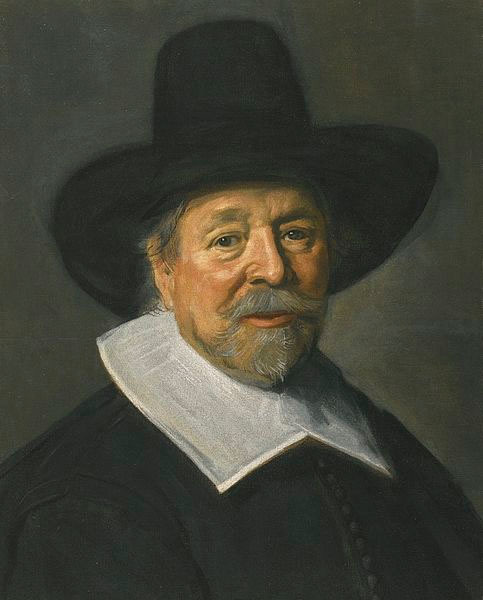 He passed shortly thereafter and was buried under the Dutch Church on April 21. Robert Livingston died in his fifty-fifth year. Coming to America as a young man, he was able to take advantage of his uncle's need for trustworthy and competent assistance to reach the top level of early Albany society. "The Nephew's" widow lived in Albany for more than a half century. Their children married into the best provincial families and enjoyed great success in the business of New York, Montreal, and the lands in between.